Fossils are stone impressions or remains from ancient living beings. Most fossils are flat and resemble roadkill. Rarely, a three-dimensional fossil is found and preserved. 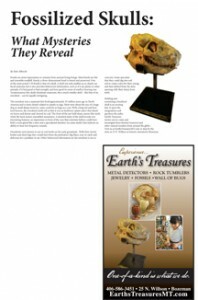 One of the most prized 3-D fossils is that of a skull. A skull not only enables us to clearly see facial anatomy, but it also provides behavioral information, such as if it ate plants or other animals, if it had good or bad eyesight, and how good its sense of smell or hearing was. Tyrannosaurus Rex skulls dominate museums, but a much smaller skull – like that of an oreodont – can be equally intriguing. The oreodont was a mammal that lived approximately 35 million years ago in North America and is most closely related to camels or pigs. Most were about the size of a large dog or small sheep; however, some could be as large as a cow. With a long tail and four-toed hooves, the oreodont’s teeth tell us that it was an herbivore (plant-eater) that dined on leaves and shoots and chewed its cud. The front of the jaw held sharp canine-like teeth, while the back molars resembled mountains. A detailed study of the skull reveals two interesting features: an impression in front of the eyes that scientists believe could have held a scent gland like a deer and a specialized chamber (in some skulls) that indicate an ability to hear low frequency sounds. Oreodonts were known to run in vast herds on the early grasslands. With their stocky bodies and short legs they would have been the prehistoric Big Macs: easy to catch and delicious for a predator to eat. Other behavioral information on the oreodont is not as concrete. Some speculate that they could dig into soft soil to create a den for their young, and then defend from the dens opening with their sharp front teeth. Holding and examining a fossilized skull is an exciting feat. It spurs the imagination and quickens the pulse. Earth’s Treasures invites you to come and investigate these limited resources and other natural wonders from around the globe. Visit us at EarthsTreasuresMT.com or stop by the store at 25 N. Willson in historic downtown Bozeman.